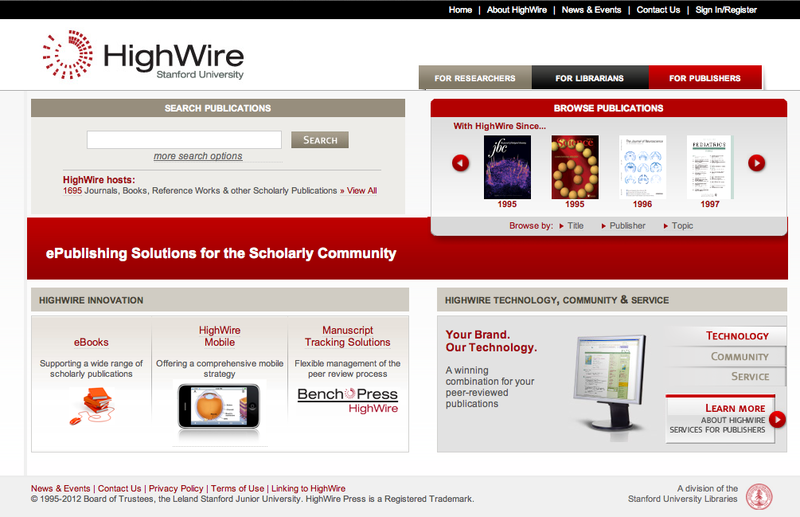 HighWire Press is a division of the Stanford University Libraries, which produces the online versions of peer-reviewed journals and other scholarly content in life sciences. HighWire Press hosts also a large repository of free full-text life science articles in the world, with more than 1,500 publications and 2 million free, full-text articles online. The website has been designed to help researchers and libraries search and gain access to the scientific literature. Hosted journals are mainly related to Medical and Biological Sciences although a more limited section is devoted to Social Sciences journal articles. The Political Science section indexes and classifies articles coming from some PS and other social sciences journals. Browsing and search allow users to retrieve metainfo and abstracts of the desired records. Direct downloading is limited by the publisher’s policy (mainly pay-per-view) and reserved to their own websites where users can find abstracts or free samples. HighWire is quite easy to navigate, thanks to its advanced search features and high-tech tools, and it is usable at a good level also by new mobile devices, through new HighWare Innovation tools.